School uniform (Ideally from September). Green jumper or cardigan (with or without a school logo). Black tights, black knee length socks or black/white ankle socks. (Black trainers only – no logos or branding in any other colours please). During the colder months, children are able to wear plain black ankle length boots during school if they choose. (Please note Dr Martins and higher length boots are not part of the uniform). Children are able to wear small stud earrings and a small watch – without gadgets please. Plain white t-shirt or polo shirt with or without the school logo (No football tops please). If my child has grey uniform trousers or white polo shirts from this term, are they able to wear these in September? Answer: We understand that the change from grey/black may take time to make the transition. As a result, children who have grey trousers, grey tights, school shorts, skirts or pinafores will be able to wear them next term, until Easter 2019. White polo shirts can be worn, for school, until we return in January 2019. Can my child wear black trainers with white ticks on them? As has been mentioned in numerous newsletters before summer, during school time (apart from outdoor PE), children are expected to wear black school shoes or plain black trainers, so branding or additional colours are not part of our uniform. Do jumpers and polo shirts need to have the amended school logo on it? We would prefer children to wear the polo shirts and jumpers with the new school logo on, but we understand that this can be costly. Therefore, children are able to wear polo shirts, cardigans and jumpers with no school logo on if you prefer. I know the new logo is slightly different on the uniform for September – can my child wear uniform with the old logo on? 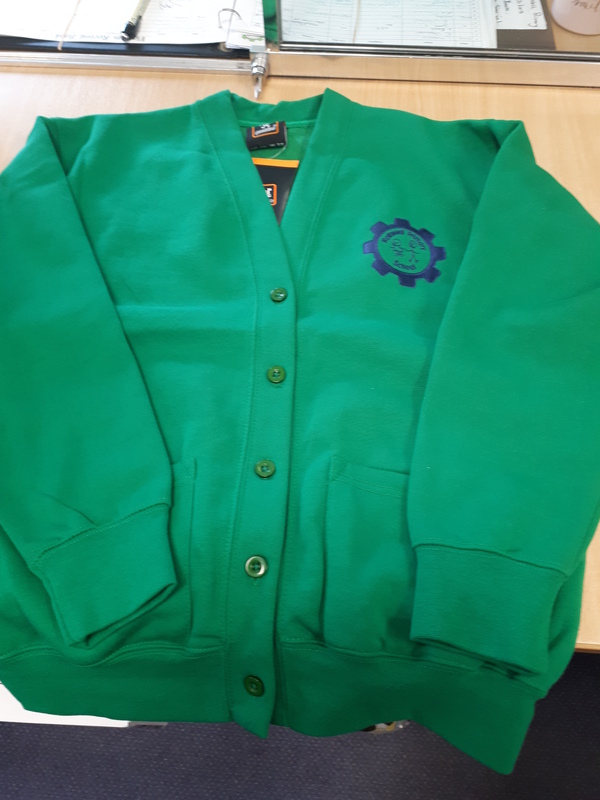 The children are able to wear green cardigans, polo shirts and jumpers that have the older logo on them. There is no deadline for changing these over.